The church register for Hohen Schönau, Kr. Naugard, Pommern [where Carl & Wilhelmine (Rix) Maass lived before emigrating to the United States] is archived in the Pommersche Evangelische Kirche Landeskirchliches Archive which is located at Karl-Marx-Platz 15 in Greifswald, Germany. This register and several other registers for nearby villages have never been microfilmed by the Mormon church and so the information they contain can only be seen by going to Greifswald, which is due north of Berlin on the Baltic coast. On June 1-3, 1999, I visited the archive and extracted the following information about our Maass family ancestors. The Hohen Schönau church register was a gold mine of data and held far more information about our ancestors than I had ever hoped to find. It revealed that Carl, Julius, & Johanna’s father and mother lived and died in Hohen Schönau. Their names were David Maass and Friederike Prahl (also spelled Prohl). No middle names were given. David was a proprietor and master tailor (Eigenthumer & Schneidermeister) like his son Carl. But he died of Lungenschlag [literally, a lung stroke] on May 27, 1858 at the young age of 48 years, indicating that he was born about 1810. He was survived by his wife and eight children aged 7 to 22 (six sons and two daughters). This was an astonishing discovery as heretofore we were only aware of three children. The ages corresponded with Carl being the oldest at age 22 and Johanna the youngest at age 7. [Curiously, the register said the youngest was a son of seven years. Church records for Regenwalde, discovered at the State Archive in Szczecin, Poland in May 2001, revealed that the youngest child was a son named Eduard Franz Wilhelm who was born February 22, 1853. It is not known if he was living when David died, but he would have been only five years old]. Their mother, Friederike, lived nearly 30 years longer and died April 20, 1887 at age 76 years, 5 months, 14 days. This was about five years after Heinrich and Johanna Lüdke immigrated to the United States. No birth records for any of David and Friederike’s children were found in the Hohen Schönau church register, indicating that all the children were born elsewhere. 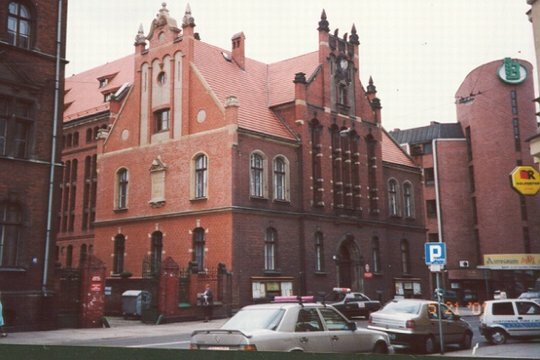 Although the records at the State Archive in Szczecin are incomplete, they documented the births of the three youngest children, all born in Ornshagen and baptized at Regenwalde. This finding substantiates the information on Julius Maass' petition for immigration where he stated that he was born in Regenwalde. For an account of our research in Szczecin, click here. The Hohen Schönau register listed the marriages of five of the eight children. There was no entry for Julius and Emilie’s marriage probably because Julius was a resident of Braunsforth at the time of their marriage in 1873. The archive did not have the church register for Braunsforth and none has been located elsewhere. Carl and Wilhelmine Louise Ernestine Rix were married in Langkafel on Dec. 12, 1867. (The exact date was listed in the Langkafel church register). Carl was 31 ½ years old and Wilhelmine was 21 years, 6 months, 9 days old. Wilhelmine’s father was Friedrich Rix, a small farmer (Halbbauer) from Langkafel. The surname was confirmed to be Rix (not Rick or Rieck) but was also spelled Riex in the Langkafel register. The Langkafel register shows that Wilhelmine’s parents, Carl Friedrich Rix (29 years) and Justine Wilhelmine Henriette Borchard (26 years) were married March 14, 1845. Justine’s father was Gottfried Borchard, a property owner (Eigenthumer) from Neuendorf. Wilhelmine was born on May 12, 1846 and baptised on May 15. Except for a different third name (Caroline instead of Ernstine), it appears that Ernstine and Friedrich Hartwig may have had a daughter born November 24, 1861. The entry lists a girl named Johanne Emilie Ulrike Hartwig whose parents were Friedrich Albert Hartwig of Faulenbenz and Johanne Wilhelmine Caroline Maass. One sponsor was Heinrich Maass of Hohen Schönau. August (25 years) and Caroline Charlotte Friederike Schulz (29 years) were married May 11 1867 in Labuhn. Caroline’s father was Gottfried Schulz from near Labuhn. Johann and Charlotte Caroline Knaspe (widow of Friedrich Kahlenberg) were married in 1867. No ages were given and both were from Sellin, Kr. Greifenberg at the time. [The Sellin church register, however, did not record this marriage]. August & Louise were sponsors for Carl & Wilhelmine's children. Julius Maass sponsored one of their children. Wilhelmine (Rix) Maass sponsored one of their children. One of August's given names is David. It was common practice to name a son after his father and none of the other sons had this name. The Hohen Schönau register also listed the full names, birthdates and sponsors of all 15 of Carl & Wilhelmine's natural children. Their oldest daughter, Auguste Wilhelmine Emilie Rix, who stayed in Germany with her husband was the daughter of Wilhelmine, not Carl. She married a Max August Wilhelm Lemke from Stettin on December 5, 1890. No ages were given. Max’s father was Herman Lemke. [Family records state that Auguste’s husband was Carl Lemke but this name did not appear as one of Max’s given names]. Wilhelm was born May 15, 1869 and baptized in June. His sponsors were Albert Maass, a gardener (Gärtner) from Faulenbenz; Julius Maass, a shepherds helper (Schäferknecht) from Daberkow; ? Schutt; August Bernhardt Neuendorf from Naugard; and Albertine Rix, the frau? or daughter? of the Halbbauer Rix in Langkafel. Wilhelm died of Drüsenentzündung [translated as inflamation of a gland or adenitis] on November 23, 1887 at the age of 18 years, 6 months and 8 days. [Family lore said he supposedly died after seeing a great ball of fire in the forest]. At the time of his death, Wilhelm was learning to be a tailor (Schneide lehrling) like his father and grandfather. Herman was born December 6, 1870 and baptized on December 26. His sponsors were August (Unknown) from Hohen Schönau; Wilhelm Rix of Pflugrade; Herman Rix of Langkafel; Auguste Hannermann of Hohen Schönau; and Emilie Matthies (sp?) of Langkafel. Amelia was born January 12, 1873 and baptized on February 9. Her sponsors were August Wolf from Hohen Schönau; Louise (Christian) Maass, wife of the shepherd, August Maass of Klein Kniephof; Johanne Maass, daughter of deceased Eigenthumer Maass of Hohen Schönau; Gustav Heller of Langkafel; and Emilie (Hoefs) Schutt, frau of ? Schutt. Martha was born October 27, 1874 and baptized on November 22. Her sponsors were Wilhelm Rix, a farmer (Bauer) from Langkafel; ? Friedrich Rix; and Wilhelmine Lübke, daughter of Eigenthumer Lübke of Pflugrade. Albertine was born September 6, 1876 and baptized October 22. Her sponsors were Heinrich Lüdke from Zampelhagen; Carl Rix from Langkafel; Wilhelm Rix; Ernestine Schutt; and ? Trettin from Naugard. She died of whooping cough (Keuchhusten) on May 25, 1877 at the age of 8 months and 19 days. Bertha was born January 30, 1878 and was baptized the next day. Her sponsors were either Friedrich Rix or his wife Ernestine (Borchardt) Rix from Langkafel; and either August Wolf or his wife Wilhelmine (Kamrath) Wolf of Hohen Schönau. A third sponsor’s name was undecipherable. Bertha was born weakly and frail and died three days later on February 2, 1878. Minnie was born April 27, 1879 and was baptized June 8. Her sponsors were Bertha (Hensel) Rix of Langkafel; Louise Keller (or Heller); Julius and Emilie Maass of Braunsforth; Gustav Bernhard Maass of Langkafel; and Friedr. Schütt of Langkafel. Bertha Marie was born May 14, 1881 and was baptized June 12. Her sponsors were David Rix of Braunsforth; Wilhelmine (Kanuth?) Klug of Hohen Schönau; and Anna Borchardt of Neuendorf. She died of diptheria on November 19, 1884 at the age of 3 years, 6 months and 5 days. Marie was born February 27, 1883 and was baptized March 26. Her sponsors were Ferdinand Boettcher of Pflugrade; August Maass of Langkafel; and frau Maass of Faulenbenz. Frank was born September 9, 1884 in Hohen Schönau and was baptized on November 9 in Pflugrade. Sponsors were Wilhelm Rix, an Eigenthumer from Hohen Schönau; Friederike (Prohl) Maass, widow of Eigenthumer Maass; and Albert Stoege? of Neuendorf. Hattie was born November 25, 1886 and was baptized December 27. Her sponsors were August Borchardt of Neuendorf; Emilie (Goetz) Rix of Langkafel; and Louise Maass of Eichenwalde. Carl and his twin brother were born October 6, 1887 and Carl was baptized October 11, the same day his twin brother died. His sponsors were Friedrich Maass of Eichenwalde; August Wolf of Hohen Schönau; and Emilie Tolzmann. Although the church register gives no name for Carl’s twin brother, siblings thought his name was John. He was born the 11th hour (one hour after Carl) on October 6, 1887 but was weakly and frail and died five days later on October 11. No baptism or sponsors were indicated. Reinhard was born June 4, 1889 and baptized on July 7. His sponsors were Heinrich Maass of Gollnow; Franz Maass of Eichenwalde; and Anna (Wienke) Rix, frau? of Eigenthumer Rix from Hohen Schönau. Bernhardine was born September 1, 1890 and was baptized October 19. Her sponsors were Herman Rix, Eigenthumer from Langkafel; Wilhelm Tolzmann, worker (Arbeitsman) from Hohen Schönau; and ? H. Tesch. The Langkafel and Zampelhagen church registers listed the full names, birthdates and sponsors of Heinrich and Johanna Lüdke’s four children who were born in Germany -- Bertha, Anna, Emilie, and Ida. Bertha was born in Langkafel on March 16, 1875 and was baptized April 4. Sponsors were Alb. Gorks of Hohen Schönau; W? Tolzman; and ? Maass. The entry states that her father, Heinrich, was an Eigenthumer from Ludwigsthal. She died of German measles (Rötheln) in Zampelhagen on August 18, 1877 at the age of 2 years, 5 months and 1 day. Anna was born October 27, 1876 and was baptized in Zampelhagen on November 26. Her sponsors were ? Rix of Langkafel; Emilie Hoefs of Zampelhagen; Auguste ? (could be Jacob) of Hohen Schönau; August Maass, a shoemaker (Schuster) from Pflugrade; and Julius Maass, a shepherd (Schäfer) from Braunsforth. Emilie was born November 25, 1878 and was baptized in Zampelhagen on Dec 15. Her sponsors were Wilh. Tolzmann of Hohen Schönau; either Herm. Hoefs or his wife Emilie (?) of Zampelhagen; and Jacob? (Marohl?) of Hohen Schönau. Ida was born April 9, 1881 and was baptized the next day in Zampelhagen. Her sponsors were Fried. Grube of Hohen Schönau; Wilhelmine (Kamradt?) Wirk of Zampelhagen; and Wilhelmine Fischer.